Donnell Rawlings: 2016 has already started off with a bang for Donnell, he has already been cast in Kevin Smith’s pilot Hollyweed. 2015 was a huge year for Donnell Rawlings, he lit the stage at The Dubai Comedy Festival. He also rocked it at Montreal Comedy Festival. He has been touring all over with Dave Chappelle. In 2014 he killed during a record number of shows working with Dave Chappelle at Radio City Music Hall in NYC. You just saw him starring in his own show as Judge Rawlings on MTV2’s Guy Court. Donnell was also was a cast member on MTV2’s Guy Code. Donnell can be seen hosting Staann' Dup to be seen on StarzBlack. He lends his voice in a recurring role as “Another Cat Named Rally” on the hit animation Black Dynamite as well being featured in Adult Swim’s animation. 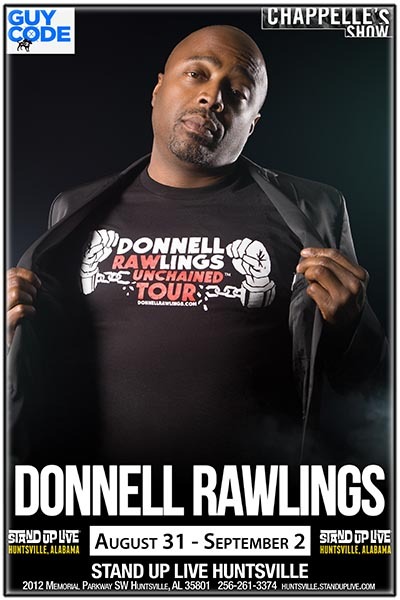 Donnell continues to tour heavily, performing his intelligently bold stand-up throughout the US, Europe, and the Caribbean. Donnell is an overnight success a decade in the making. He made a splash in the DC comedy clubs going from a heckler in the audience to HBO's Def Comedy Jam in a period of six months. You’ve seen him as 'Ashy Larry' on Comedy Central’s award winning and critically celebrated Chappelle’s Show, where he joined Dave Chappelle as both as a writer and performer. He will also be featured in Queen Latifah's new movie Percentage. His 1-Hour Stand-Up “Ashy to Classy” premiered on Comedy Central in October of 2010. He was a co-host on both Power 105’s (NY’s #1 Hip Hop and R&B radio station) morning show “Egypt and Ashy in the Morning” and “The Big Tigger Morning Show” on WPGC in Washington DC, and he enjoyed weekly guest appearances on New York’s Hot 97 Morning Show. He was a regular on E!’s “Chelsea Lately", starred in Comedy Central's “Reality Bites Back,” and was the resident “Funny Guy” on the Ricki Lake Show. In 2007, Donnell co-created and starred in Heavy.com’s hit web series “From Ashy to Classy”, which was picked up for a second round of episodes. His movie of the same name screened at the 2011 L.A. Comedy Shorts Film Festival. As an actor Donnell has also appeared in the Law & Order series, Special Victims Unit (SVU) and Criminal Intent (CI) as well as NBC’s Third Watch, the Emmy-Award winning HBO Mini-Series: The Corner and as Day-Day Price on HBO’s Emmy-Award winning series “The Wire.” On the big screen he could be seen in the blockbuster Spider-Man II.